The sky’s the limit for clients booking one of andBeyond’s Private Jet Journeys. Customers traverse Kenya, Tanzania, Zimbabwe and South Africa in light aircraft, including a Bombardier Challenger, a Pilatus PC-12 turboprop charter and helicopters for the more remote destinations. AndBeyond chief executive Joss Kent says the use of private planes not only creates an exclusive experience, but also helps to minimise travel duration and maximise the time at each destination. “As clients become more sophisticated, they are looking for more authentic experiences, which they want to share with as few people as possible. Our travel plans also offer them a chance to participate in meaningful activities relating to culture and conservation,” he adds. Experiences include a hot air balloon ride, game drives and visits to a selection of Africa’s national parks and reserves. It may not be a dead ringer for Jules Verne’s 19th-century novel, but Oceania Cruises’ newest voyage comes close enough to replicating the adventures of Phileas Fogg and his trusty valet Passepartout. The luxury liner’s Around the World in 180 days itinerary onboard Insignia will see clients cross the equator four times, visiting 95 ports of call and exploring 38 countries. Bob Binder, Oceania Cruises president and chief executive, says that with highlights including visits to 67 Unesco World Heritage Sites, the cruise should be unmissable for bucket list adventurers. The cruise represents the brand’s most expansive focus on Japan too, with nine ports of call across the island nation. Clients will also have the chance to experience shoreside events in Cape Town, Rangoon and Hong Kong. Picture this – you’re 290 metres above sea level, soaking up the views of the Al Hajar Mountains. Suddenly the ancient fishing villages around the expansive Gulf of Oman come speeding towards you as your pilot brings the paraglider safely in to land at your resort. Guests staying at Six Senses Zighy Bay have the option of living out not just one, but three James Bond- esque fantasies, says Jenny Basham, product manager – Caribbean, Mexico, Indian Ocean and Arabia at Carrier. “For adrenaline junkies, there isn’t a better way to arrive at Six Senses Zighy Bay than by a four-wheel drive through the dramatic hills, paragliding down the mountainside of the northern Musandam Peninsula or by speedboat too,” she adds. Basham recommends guests twin their experience with a few nights in a luxury eco-friendly tent at the Al Awir Magic Arabia Camp, Dubai. Home to 5% of the world’s known animal and plant species, Madagascar is the ideal bucket list destination for nature lovers, explains Candice Buchan, Africa product manager at Rainbow Tours. “For travellers wanting to experience Madagascar in style, we recommend a stay at Miavana, which takes luxury to a completely new level,” she says. Buchan points agents to Rainbow Tours’ Madagascar Made Easy Deluxe itinerary. 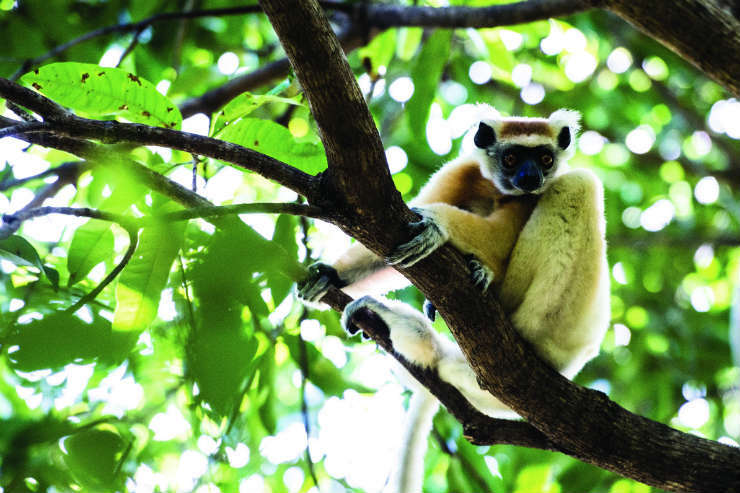 The 12-day trip will take clients to the lemur-rich rainforests of Andasibe-Mantadia national park, before a transfer to the five-star Anjajavy Le Lodge, where they have the option to take an overnight excursion to Sahamalaza-Iles Radama national park to spot the earth’s most endangered primates. Clients searching for an extra level of gastronomic indulgence should look to Belmond’s newest tour, The Great Food Adventure: Peru. The 11-day itinerary encompasses stays at several of the brand’s hotels, journeys on the Belmond Hiram Bingham and the Belmond Andean Explorer and the chance to sample Peru’s most iconic dishes. Highlights include attending a pachamanca ceremony where a mixture of spiced vegetables and meat are buried under hot stones, and making Peruvian salsa with the Willoq community, renowned for their weaving and textiles. Cristopher Mendoza, train manager, Belmond Andean Explorer, says this is the first time guests can experience Peru’s famous culinary credentials across multiple Belmond products. “Every experience is about creating authentic and unforgettable moments, such as having breakfast by the edge of the Colca Canyon, or meeting the local communities that harvest and maintain Peru’s famous potato varieties. Additional experiences include a guided tour of the Surquillo market with a Belmond chef in Lima, a stop at the Inca fortress of Sacsayhuaman north of Cusco and the chance to explore the Colca Valley by horseback before learning to mix a chilcano during a cocktail-making class.